A judge has sent jurors home in the trial of admitted Boston Marathon bomber Dzhokhar Tsarnaev after their first day of deliberations. Judge George O'Toole Jr. dismissed the jury Tuesday after a little more than seven hours of deliberations. The judge said jurors sent him two notes containing questions shortly before the day's end. He did not share the contents of the notes publicly but told the jurors he will answer their questions Wednesday morning. Jurors are considering 30 charges against Tsarnaev stemming from the 2013 attack that killed three people and wounded more than 260. If they convict him, they will then decide whether he should be sentenced to death or receive life in prison. Deliberations in the guilt phase began almost two years after twin bombs exploded near the marathon's finish line on April 15, 2013, killing three people and wounding more than 260. The jurors deliberated for about seven hours before being sent home just before 5 p.m.
"This was a cold, calculated terrorist act. This was intentional. It was bloodthirsty. It was to make a point," Aloke Chakravarty said. "It was to tell America that 'We will not be terrorized by you anymore. We will terrorize you.'" Clarke argued that Tsarnaev fell under the influence of Tamerlan. Clarke repeatedly referred to Dzhokhar Tsarnaev - then 19 - as a "kid" and a "teenager." 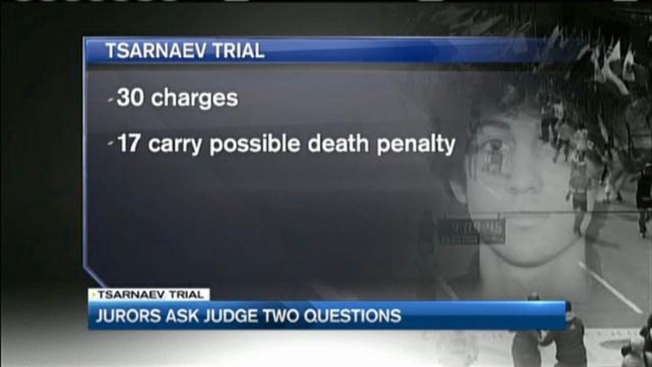 If Tsarnaev is convicted - and that is considered a near certainty, given his lawyer's admission - the jury will then begin hearing evidence on whether he should get life in prison or a death sentence.